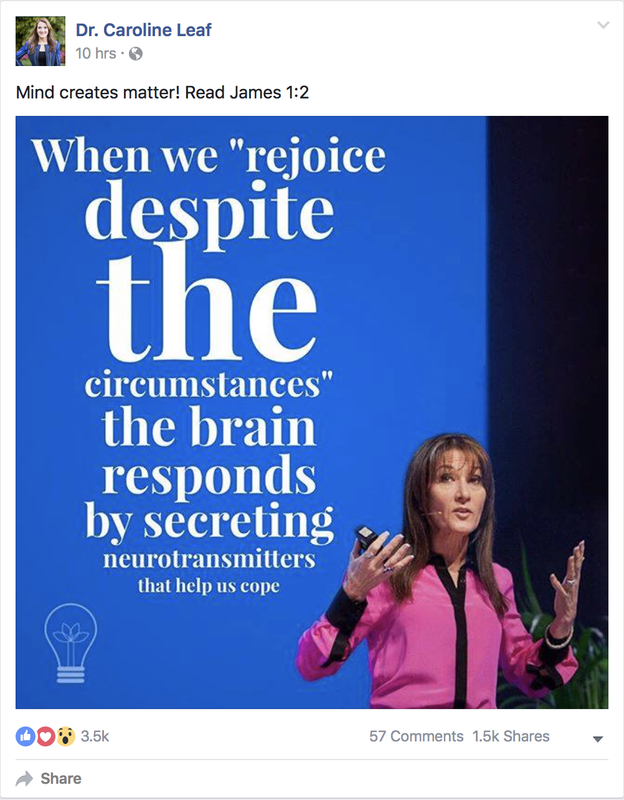 Dr Caroline Leaf, communication pathologist and self-titled cognitive neuroscientist, broke the most fundamental rules of both science and Christian teaching in her social media post today. Dr Leaf’s statement not only violates the laws of physics, but it also contradicts the Bible by elevating the human mind to the level of God himself. In our physical universe, matter, like energy, is conserved. It can not be created or destroyed. The amount of matter that goes in to a chemical reaction is the same amount at the end of a chemical reaction. Suggesting that our mind ‘creates’ matter violates this basic law known by every high school chemistry student. There are only two explanations for the creation of matter – the Big Bang or God’s creation. Most Christians believe the second explanation, that God was the only being to create matter which he did during the six days of creation. By saying that our minds create matter, Dr Leaf is saying that our minds have the same amount of power that God does, a suggestion that’s incongruent with basic Biblical truth. So much for being a scientific and Biblical expert. In just three little words, Dr Leaf manages to violate the most basic principles of science and Christianity. To add salt to the wound, Dr Leaf tries to justify her unscientific heresy by referencing James 1:2, as if tagging a scripture will somehow vindicate her. Except James 1:2 says, “My brethren, count it all joy when you fall into various trials”. Well, that’s awkward … James 1:2 has nothing to do with matter or the mind. Her meme is just as irrelevant and unscientific. Ummm … the brain does everything by releasing neurotransmitters. That’s how the brain works. It releases neurotransmitters when awake or asleep, active or resting. There are no specific neurotransmitters just for coping, or for when we ‘rejoice despite the circumstances’. Her statement is meaningless. There would many in Dr Leaf’s camp that would try and defend her statement by claiming that it was a poor choice of words perhaps, or that it was meant to be taken metaphorically not literally. Sure, if that’s how you want to continue to delude yourself, then be my guest, but really there isn’t much wriggle room here. How else can you interpret the words ‘create’ and ‘matter’? You can’t really misrepresent it as matters of fact, or matters of law, or a state of affairs. Dr Leaf meant it as the mass noun form of the word, “physical substance in general, as distinct from mind and spirit; (in physics) that which occupies space and possesses rest mass”. And the word ‘create’ … we all know the meaning of that word, “to bring (something) into existence”. It wouldn’t make any sense to say that the mind causes matter to happen as a result of one’s actions, or that the mind invests matter with a title of nobility. It might be common to metaphorically say, “mind over matter” but there’s no metaphorical meaning for “mind creates matter”. And so with just three little words, Dr Leaf contradicts the most basic of all principles of science and Christianity, and aptly demonstrates the irreconcilable deviation of her teaching from reality. She has shown how willing she is to take an irrelevant scripture and try to use it to justify a misguided pseudoscientific proclamation. Today’s meme calls her claim as a Biblical and scientific expert into serious question. This entry was posted in Biological, Caroline Leaf, Psychological, Spiritual and tagged caroline leaf, cognitive neuroscientist, criticism, false teacher, god, James 1:2, law of conservation of mass, matter, meme, mind by cedwardpitt. Bookmark the permalink. Honestly doc, where is this woman leading people? I guess you’d have to ask the people who want to follow her lead, but I don’t think it’s anywhere good. Agreed. It’s hard to not judge what’s in her heart but I really do despair of the things she is coming out with. She is getting very bold with her statements. I’m sure she will have to give account in the end though, as will we all! Matt. Your email raises some important issues. Firstly I am not concerned to defend or otherwise Dr. Leaf. Concerning Dr. Leaf I feel that the wisdom of Gamaliel applies Acts 5: 38-39. The issue more pressing is can we demand that Jesus always functioned within the modern laws of science? Clearly not, the Creator has to power and authority to overturn the natural laws He created. Well Romans 4:16-17 tells of the quality if faith available to all believers. Like Abraham we believe that God can create something out of nothing. In fact the test of a true believer is belief in Jesus being raised in the flesh. Now surely this is all God’s work through the power of His spirit. So the question remaining is can He elect to manifest this creative power in our minds as we align ourselves to His word and receive the renewing referred to in Romans 12:2. Finally, how do we measure if this is indeed happening? Sadly this is hard to find in modern Christianity. There’s a lot of nuanced theology wrapped up in your series of questions posed here. For me, I’d contend that miracles are outside the natural laws of science, although we honestly can’t know whether the miracles performed created new matter or simply rearranged it. The biggest question is who did those miracles. There’s debate around whether it was Jesus himself, or the Holy Spirit on Jesus’ behalf, but either way, the miracles weren’t related to the power of the human mind, they were related to the inherent power of the trinity. Therefore similarly, if we as modern believers were to perform modern-day miracles, is it the power of our minds that are performing miracles, or the power of the Holy Spirit whom we are obeying? Personally, I think in Romans 12:2 that renewing our minds allows us to see things from God’s perspective rather than making our minds as powerful as Gods, or that our minds become God-like. So I stand by my original premise. Our minds do not create matter. If miracles occur then that’s not our minds performing those miracles, but the power of God. Thanks for the stimulating discussion. All the best to you. I have followed your ongoing assessment of Dr Leaf’s theories with interest, and would like to make some observations on your latest post on “those three little words”, i.e “mind creates matter”. Where is she coming from? Whence this preoccupation with “mind”? As you have repeatedly stated, mind is simply the brain functioning, as music is the instrument or voice expressing. There is no music in the piano, nor a structure called mind, located in the cranium. In a nutshell, Caroline Leaf is vintage Word of Faith. Which is a blend of Christianity, Gnosticism, Mind Sciences, Eastern Mysticism, Secular Psychology. At the outset I believe we are all agreed that there is a strong correlation between our thoughts and how we live. The bible has a lot to say about right thinking. No one would disagree that an action is usually first conceived in the mind. The thought precedes the deed. Prov 4:23 “Above all else, guard your heart, for it is the wellspring of life…”( Heart is here the metaphor for mind, as in many other places in scripture eg Matt 9:4 “But Jesus, knowing their thoughts, said, ‘Why do you think evil in your hearts?” ESV.) Even in amoral things, a project is first of all an idea in the mind, maybe a picture in the mind. A strategy is developed – in the mind – long before the first step in the implementation is taken. A trip is planned, also in the mind, before any concrete arrangements are made. We are creatures of reason, unlike animals, who act on impulse and instinct. Sinful thoughts usually result in sinful intentions which overflow into sinful actions. (eg Jesus on adultery – thought and action are placed on the same level – Matt 5:28 “But I tell you that anyone who looks at a woman lustfully has already committed adultery with her in his heart.”) Thought (dwelling on sin, incubating) and deed are undeniably linked. And who would disagree that there is a gulf of difference between a problem maker and a problem solver, a complainer and an encourager, a quitter and a perseverer, someone who habitually says “I can’t”, and someone who says “I can” – and it all starts in the mind. Having an optimistic disposition in every situation attracts positive changes- (the half-empty or half-full glass). A state of mind that opposes negativity, defeatism and hopelessness is definitely desirable. (As an employer, which of the two would you appoint?) It is a good thing to develop mental toughness, confidence and maintaining positive attitudes. And yes, it is a known fact that some diseases can be traced to the mind, eg anxiety, stress, worry, unforgiveness, bitterness, etc, albeit probably quite a small percentage, as per your Australian survey. The mind is indeed the wellspring of life NIV (“determines the course of your life” NLT, “…the source of all life” NEB, “…from it flow the springs of life” ESV), of either polluted water or pure water. The choice is ours, to overcome negative emotions such as stress, anxiety, fear or anger. BUT the idea of the mind as a creative force was developed by non-Christians. When you start pushing the envelope, you end up with an occultic notion of mind. A truth which is stretched too far, becomes a Lie. Our minds, our thinking, is important, and scripture abounds with passages about the right use of our minds. (too numerous to mention). We are all agreed that our outlook has an effect on our lives, but when you take the concept of the mind too far, you begin to enshrine it as The First Cause. And gradually you begin to elbow God out of the way until he is merely an onlooker, and Mind rules the world and determines destiny. This has been happening since the 19th century as far as I am aware. The creative power of the mind was developed in the nineteenth century by secular philosophers. According to them, by application of the mind, man is capable of transforming his nature and healing his diseases, but not only this, the mind has the ability to conceive of realities other than ethical ones, to shape destiny and create material things. Man in fact becomes a creator. The objective of mind control is the Lordship of man. Man becomes master of his destiny. God is effectively neutralized. Emil Coue in the nineteenth century developed a method which relied on the principle that any idea exclusively occupying the mind turns into reality. By teaching people autosuggestion through imagination (in truth self-hypnosis), and reciting a mantra (“every day, in very way, I’m getting better and better”) he claimed to have healed many. In 1877, the term ‘law of attraction’ appeared in print for the first time in a book written by Helena Blavatsky. By the end of the 19th century the term was being used by New Thought authors such as Ralph WaldoTrine, but for them the law of attraction not only affected health but every other aspect of our lives. The 20th century saw a surge in interest in the subject with many books being written about it, amongst which is one of the best-selling books of all time, “Think and grow Rich” by Napoleon Hill (60 million copies sold). In this book, Hill insisted on the importance of controlling one’s own thoughts in order to achieve success, as well as the energy that thoughts have and their ability to attract other thoughts. In his book, which I bought to verify the facts, Hill claimed to have had his own spiritual guide. Annie Besant, another theosophical author, discussed the ‘law of attraction’ in 1919. The New Age movement adopted many New Thought ideas, including the law of attraction. He taught that a man’s state of mind – what he believes and confesses – will eventually produce a corresponding reality, whether good or bad. In other words, what they are saying, is that thoughts become things. The Secret is a best-selling 2006 self-help book written by Rhonda Byrne, based on the earlier film of the same name. It is based on the law of attraction and claims that positive thinking can create life-changing results such as increased happiness, health, and wealth. The book has sold more than 19 million copies worldwide and has been translated into 46 languages. The book describes the law as accounting for a magnetic power that is emitted through one’s thoughts. The power of thoughts is likened to the power in a transmission tower, which sends out a frequency to the universe and then returns the same frequency in a physical or elemental form. The law of attraction works universally on every plane of action, and we attract whatever we desire or expect. If we desire one thing and expect another, we become like houses divided against themselves, which are quickly brought to desolation. Determine resolutely to expect only what you desire, then you will attract only what you wish for. The Secret posits that the law of attraction is a natural law which determines the complete order of the universe and of our personal lives through the process of “like attracts like”. The author claims that as we think and feel, a corresponding frequency is sent out into the universe which attracts back to us events and circumstances on that same frequency. Proponents claim that desirable outcomes such as better health, wealth, and happiness can be attracted simply by changing one’s thoughts and feelings. In a nutshell, this philosophy (of the Mind Sciences) was blended with the Christian Faith by EW Kenyon, the father of the Faith Movement (Word of Faith), and developed by Hagin and Copeland. The theology of the WOF Movement is an example of religious syncretism, a smorgasbord, hodge-podge, of Christianity and something else, in this instance occultism. The mind now possesses the magical ability to render us little gods – which is exactly what many of them are saying. Eg Creflo Dollar telling his congregation, “You are not just people. You are gods”. These little gods can now create matter by developing their thought-life. These concepts espoused by secular, and occultic teachers, are now being taught verbatim from the pulpit. Following hot on the heels of the idolatry of the mind, is “the power of the spoken word”. Words now have inherent power to create reality. First the thought is conceived in the mind, incubated, nurtured etc, then it is spoken into the atmosphere, and voila, the desired result is guaranteed. It is no different from repeating mantras over and over in the hope of their fulfilment. In psychology it is known as autosuggestion, fired by imagination, which is nothing other than hypnosis. In WOF theology it is taught that “words are containers of power”, that “a word in your mouth is as powerful as a word in God’s mouth”, and “what you say is what you get.” What you desire you now need to say out loud, many times a day (mantras). To make it sound “biblical’, or “Christian”, the mantra must now be a verse or passage from scripture. The mantra has now become sanctified, because it is from “the word”. This is not the same as affirming the truth of scripture, which we all agree with. (“I have been justified, adopted, forgiven, reconciled” etc etc) That is kosher. What is happening here, is that scripture is being bent to mean something else. For example, in scripture we are commanded to be transformed into the image of Christ. It is in the imperative mode in Greek. To claim that “I have been transformed into the image of Christ” ( WOF “positive confession”) is twisting the imperative into the indicative (statement of fact). This is exactly what they are doing. Say that it is, and so it is. The exegesis of WOF is simply horrendous. This verse refers to the “ ‘many nations’ which were to spring from Abraham; not only had they no existence as yet, but ( since Abraham and Sarah had now entered a childless old age) nothing seemed less likely than that they should ever exist” (FF Bruce Romans). In fact, in the very next verse, Abraham becomes the father of many nations, exactly as God has called it. This text in its proper context has God, not me, as its subject, and the fulfilment in history was the salvation of the Gentiles. It is not a formula for creating random things. She teaches that in the beginning God just spoke the word, and created everything. Therefore, she can do the same “because I’ve been made in the image of God”. To her, and WOF theology, that means that we are little “gods”. That is exactly what she says when she approvingly quotes Creflo Dollar when he utters that blasphemy. Joyce states : “believe that words are containers of power and they either carry negative or positive power. They carry creative or destructive power. So, if I’m speaking right things I’m going to have right results. And if I’m speaking wrong things I’m going to have wrong results.” Her CD “Mind, mouth, moods, attitudes” The language is identical to the Mind Sciences. “Mantras or autosuggestions are positive words and sentences which, when repeated over and over, change your inner world, create new beliefs and vibrations which eventually change your reality. The ancient spiritual masters were all aware of the tremendous power of repeated positive statements. Nowadays known as autosuggestions or affirmations, this simple and easy technique is also at the heart of many modern self-development methods. You too can use mantras to achieve different kinds of positive goals, such as confidence or courage; better memory or concentration; recovery from disease; better relationships; getting rid of bad habits; and success in education, work or business. Then start practising them. The best way to practice autosuggestions is in the meditative level. When our body is relaxed, our mind is more open, more ready to embrace change. Now repeat the autosuggestions to yourself over and over again. Let your imagination give flight to the words. Repeat each autosuggestion between 20 and 100 times. Practice in this way twice every day. Whenever you get a few moments in the midst of your day to-day work repeat the autosuggestions. The autosuggestions will create a new resonance in your mind and body. Slowly and silently you will start changing from within. You will have a new life. “HYPNOSIS : Induction of a state in which a person is hypersusceptible to suggestion. Therefore, autosuggestion is a form of self-hypnosis. as an effective method for ending bad habits. Autosuggestions works by placing ideas into your subconscious and making it believe they are true. Back to the beginning. This is Caroline Leaf’s theology, imbibed from WOF, and the reason she is so focused on the potential of the mind. She is convinced of her theory, and every week will find some more ammunition from pseudoscience to endorse it. She seems a nice person, and I’m certain that she is a sincere believer who has a heart for God, but unfortunately she has been deceived by WOF teaching and fallen into the wrong hands. She needs to be taught more accurately/correctly, the way of God, as Apollos in Acts 18:24-26. “When Priscilla and Aquilla heard him, they invited him to their home and explained to him the way of God more accurately” ESV. Easier said than done, it must be admitted !!! Dr Ted Jacobs, Henley-on-Klip, South Africa. Many thanks for the epistle. Your opinion and comments are always welcome. No one is sucking any eggs here. Overall, I agree and I disagree. I appreciate your explanation around the way that “Word of Faith” theology is used by some of the best known tele-evangelists and the problems with it. I heard a different variation about context – “If you take the text out of context, all you’re left with is a con.” Sound applicable? I was also very interested and informed by your extensive discussion of the historical context of the philosophy of the mind, even back to the 19th century. It all makes a lot of sense when put into perspective. However I’d dispute your premise that there is a strong correlation between our thoughts and how we live. This is a attribution fallacy. It’s a common assumption held by many people, but burrowing down into the findings of neuroscience shows that thought is a conscious sliver of awareness of a much deeper and much stronger set of neurological processes. It’s likely that our conscious narrative is simply a seamless confabulation of bits and pieces the rest of our brain is perceiving (see http://www.powerofstories.com/our-brains-constantly-confabulate-stories-which-builds-a-meaningful-narrative-for-our-life for a better discussion). I also discussed our ‘constrained will’ in chapter 1 of my book (http://www.debunkingdrleaf.com/chapter-1/ under the heading “Thinking and choosing”). Actions are not first conceived in the mind. Thought does not necessarily precede the deed. I also disagree with your premise that “A strategy is developed – in the mind – long before the first step in the implementation is taken. A trip is planned, also in the mind, before any concrete arrangements are made.” Again, the neuroscience says otherwise (which I also outlined in chapter 1 under “thinking and choosing”). It’s nice that you would think of the human race as “creatures of reason, unlike animals, who act on impulse and instinct”. But again, I don’t think this is what the experts would suggest (https://cedwardpitt.com/2015/08/30/ive-got-a-brain-revisited/). Any disease that is traced to the mind is still firmly embedded in our biology. Yes, our external environment interacts with this, but it’s our biology that makes us vulnerable, and while the symptoms are psychological, the causes is biological. I understand what the scripture says, but so often we interpret scriptures through the lens of our worldview. It would be interesting to do an original language, word-by-word study of the scriptures you raised. While I disagree with you on these points, if anything, the neuroscience combined with the historical context that you’ve outlined makes Dr Leaf’s position even weaker. So I think it’s fair to say we’re still on the same page in terms of Dr Leaf’s teaching. Again, many thanks for your comments, insights and historical context. Please continue to follow my comments with interest, and you’re always welcome to comment even if you may feel it’s something you think is obvious. Hi Dr Jacobs. I received the above comment. Was this what you meant to send? If not, resend what you wanted to say and I’ll make sure its published. Take care. I’m a lay person at best. But even I can give glory to God for creating my body so magnificently that it can grow “create” new tissue “matter” to heal itself. Chill and know that He is God. (She does). Hi Traci, thanks for sharing your point of view. You’re welcome to thank God in whatever way you wish, about anything you want to. If you want to thank God for a body that creates new matter to heal itself, cool. That’s not how it works though, and if Dr Leaf was a real scientist, she would know that. Her deficiency of knowledge in this instance has nothing to do with knowing that He is God, and all to do with not knowing about the Law of Conservation of Energy, or basic scriptural interpretation. Her task, as an ‘expert’ is to provide you, as a lay person, with accurate information and not mislead you with the glittery hollowness of her fake science. So by all means, express your thanks to God in whichever way you want to. Dr Leaf still needs to lift her game or leave it.